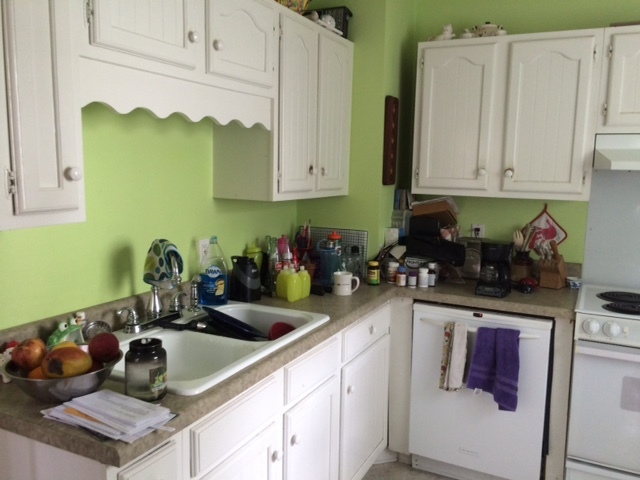 A couple of weeks ago, my family completed the kitchen module of Joshua Becker’s online Uncluttered course. 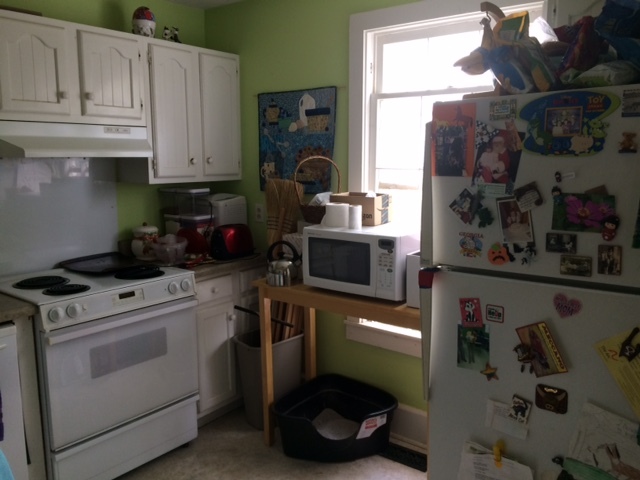 When we did our initial survey of the level of clutter in our home at the beginning of the course, we were startled to find that the kitchen ranked as one of the most cluttered rooms in the house. This is even more surprising given the fact that none of us really cooks, so we aren’t really that susceptible to collecting kitchen gadgets. We finally decided that it was the very fact that we didn’t use the kitchen as intended which allowed us to stash extra stuff there. Notice how the countertops are completely covered, and not just with dishes. 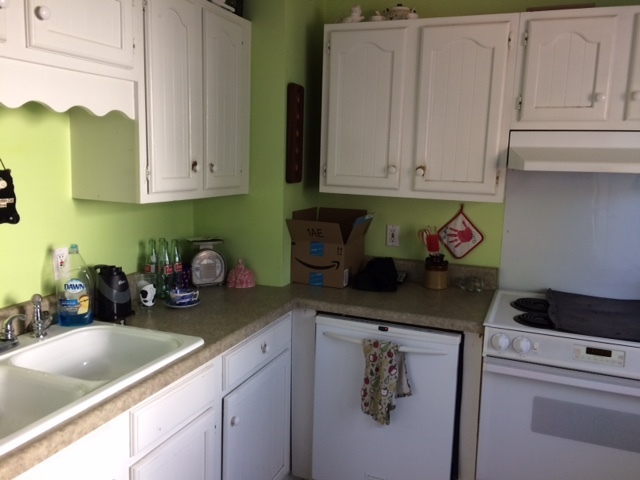 In the first photo, you can see that the lower cabinet is completely blocked and the plasticware that could be stored there is just piled on the counter. Not very efficient! So, we attacked the kitchen mercilessly and got rid of two big boxes full of stuff. Additionally, I said goodbye to my breadmaker, which I had greatly enjoyed when I first got it, but had not used in nearly two years. I found a new owner for it through Freecycle, always a win-win. We culled plasticware, mugs, dishes, papers, cookbooks, craft supplies, and much more. Additionally, we ditched the much-too-big microwave stand, and got a compact, rolling one with storage underneath. You will notice that the toaster, along with other small appliances, are no longer stored on the counter. They now live in the previously blocked lower cabinet, and are put away after each use. The microwave is on an appropriately-size rolling cart, which included tons of storage. The lower cabinet of the cart holds my soap-making supplies, as well as cookbooks and candles, and the single drawer holds medications (previously stored on the counter) and oven mitts (previously stored on top of the microwave). 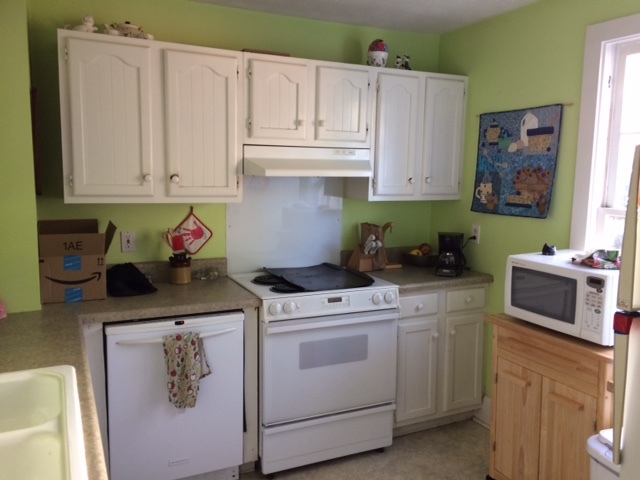 What these photos don’t show is the tidy and organized cabinets. Pots, pan, appliances, scissors, measuring cups, dishes, etc. all have plenty of room now. There are still a few odds-and-ends to clean up in the “after” photos (a box on the counter holds donations, and a couple of items on the microwave need to be cleaned so that they can be added to the box). But other than that, we are very pleased with our new kitchen! It’s super quick and easy to clean, and everyone is dedicated to keeping it clutter free. The best part is, with all the open counter space, we can now actually cook in our kitchen! Unprecedented!